Much has been written about the recent surge of personal stories being told through the horror genre in films like “It Follows,” “The Witch” and “The Babadook,” but there’s an equally interesting trend in the science fiction genre as well. Over the last few years, we’ve seen the genre used not only to examine the power of space travel or a post-apocalyptic future but as a way to address common humanity more than futuristic adventure stories. Joining films like “Gravity,” “Interstellar” and “The Martian” is Denis Villeneuve’s ambitious and moving “Arrival,” a movie that’s about the day the universe changed forever but becomes more focused on a single story even as it’s expanding its worldwide narrative. It is more about grief, time, communication and compassion than it is warp speed, and it’s a film that asks questions. How do we approach that which terrifies us? Why is it important to communicate through language and not action? The final act of “Arrival” gets to the big ideas of life that I won’t spoil here, but viewers should know that Villeneuve’s film is not the crowdpleaser of "The Martian," Ridley Scott’s big TIFF premiere last year. It’s a movie designed to simultaneously challenge viewers, move them and get them talking. For the most part, it succeeds. Amy Adams gives a confident, affecting performance as Louise, a linguistics expert brought in on the day that 12 unidentified flying objects enter Earth’s orbit. Despite what they’re telling the public—which is not much of anything at first—the governments of the world have made first contact with the creatures inside, beings that look vaguely like some higher power merged an octopus with a giant hand. Working with the military and a scientist named Ian (Jeremy Renner), Louise seeks to find the answer to a very simple question: What do you want? The Heptapods, as they’re eventually called, speak in sounds that echo whale noises at times, but Louise quickly learns that written language is the way to communicate, even deciphering the complex way the interstellar tourists write. As she gets closer and closer to being able to convey that crucial question in a way that it (and its answer) will be understood, the world’s uneasiness continues. Will man’s protective instinct kick in before its science and language leaders can figure out a way to stop it? Louise also has darkness in her life. The opening scenes detail the birth, brief life and death of a child. Throughout, Adams imbues Louise with a quiet, effective emotional undercurrent that’s essential to the film’s success. This is a movie that gets too sterile at times, but Adams is always there to ground it. Villeneuve’s vision is not particularly CGI-heavy, allowing Adams to work in a way that feels relatable. There’s so much going on in this character’s mind and heart, especially in the twisty final act, with which Adams could have “gone big,” but it’s actually one of the more subtle and internal sci-fi movie performances that I’ve ever seen. And it’s a testament to the success of “Arrival” that it’s her face—not the impressive alien ship/creature design—that people will remember. As he has recently, Villeneuve understands the importance of surrounding himself with talented people. In this case, two of the film’s undeniable MVPs are cinematographer Bradford Young, the genius who shot “Selma” and “A Most Violent Year” and composer Jóhann Jóhannsson. The latter’s compositions here are essential to every emotional beat of the film, defining the air of tension in the first half of the film and the moving undercurrents of the final act. Young’s approach is beautifully tactile, using the natural world to make this unnatural story genuine. We may not be able to fully relate to Louise’s narrative, but we can appreciate the image of a child running through a field. Young’s imagery is fluid, unlike the choppy blockbuster cinematography that we’re used to seeing in sci-fi. Most importantly, it feels like everything here is of one vision—cinematography, direction, acting, score, etc.—instead of the factory-produced blockbusters we’ve seen of late. Despite all of that, “Arrival” sags a bit in the middle, a point when it may lose some viewers for good. 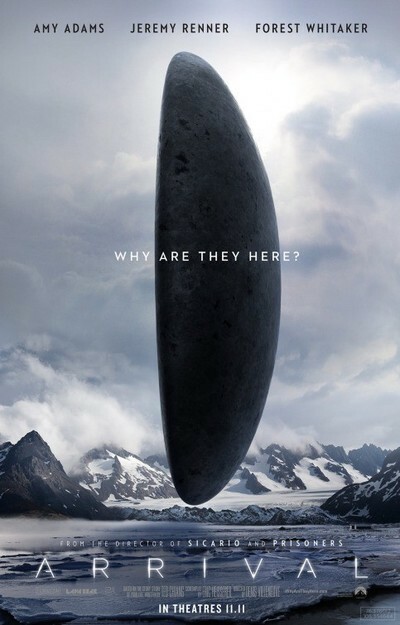 The “first contact” act is undeniably confident and the final thematically purposeful scenes of the film are stunningly ambitious, but the pace of “Arrival” softens a bit too much in the middle and one notices the sterility of the piece overall. Without spoiling anything, maintaining the shock value of the twists of the final act forces some narrative decisions in the mid-section that keep us observers to the action of the film when we’re ready to be participants. Villeneuve is a talented director, but this movie lacks a degree of heat that would have helped it hit the emotional and philosophical beats of the final scenes. As is, we often feel like we’re behind the barrier that Louise uses when communicating with the alien creatures she dubs Abbott and Costello. Like she wants to do, we so want to take off the equipment and get behind that screen. Having said that, this is ambitious, accomplished filmmaking that deserves an audience. It’s a film that forces viewers to reconsider that which makes us truly human, and the impact of grief on that timeline of existence. At its best, and largely through Adams’ performance, the film proposes that we’ve all had those days in which communication breaks down and fear over the unknown sets in. And it is the best of us who persevere, get up from being knocked down and repair that which is broken. This review originally ran as a part of our Toronto International Film Festival coverage on September 10, 2016.